Are You Ready to be More Active and Fit? - Purposeful Nutrition: Healing With Food. Are You Ready to be More Active and Fit? We all know we should be more active. Sometimes the question really is how and where? For many folks, the gym is not an option, either because of cost or because it is just too hard to get there regularly. Or if you are a mama with littles or homeschooling, you can’t just leave the kids at home when you need to go work out. I have a solution for you – Fit2B – an online workout studio that is designed for women and especially for moms, who need to workout at home. There are a number of different workouts available. One option is that they are sorted by time lengths. You can look for workouts that are 10 minutes all the way up to 31 minutes. The interface is really cool, because when you click on a category, the interface will change to give you all the workouts that meet your criteria. You can also sort by level of challenge – challenging, easy, medium, and relaxing. And you can sort by kinds of routines – cardio, pilates, non yoga, yoga, kids, post pregnancy, pregnancy, foam rolling. The last option of categories is core, lower body, upper body, and pelvic floor. And if you are just getting started you can click on Workout > Start Here for an awesome beginning, especially if you’re managing diastasis or prolapse. The Start Here Tab is really great, especially if you have not been active before getting on the site. I went through the Foundational 5, which is one of the starter sets. It is a 5 different very gentle routines that work on breathing, alignment, and stretching exercises. What I liked about these is they are a great way to get into exercise, if you have not been active. It can be very intimidating to get into exercising if you have not been doing it and it is easy to avoid doing anything because of fear. I love this system because the instructors talk you through really simple but powerful moves to get yourself started in good body movement and stretching. The explanations are clear and thorough and you are able to watch the instructor as well as listen to her. I honestly think anyone would feel comfortable watching this and getting started. Especially if you are doing this in the comfort of your home you will find that it is not intimidating to begin to exercise. (Two other starter sets are the Fit2B Beginning Path and the Starter 7. There is also a Foundation 5 e-course which is another way to get started in the same foundational exercises, mentioned above. Something cool about the e-course is that once you purchase this, it is yours for life. You can download it and use it long term, even if you don’t stay a member of Fit2B. 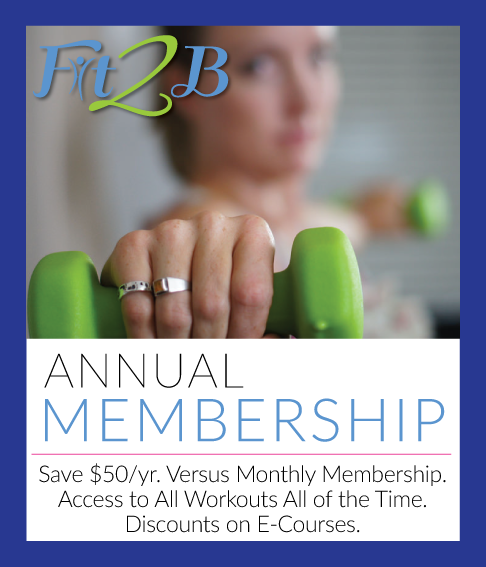 Fit2B is a membership site that is really special. The focus is on core health and total body strength, endurance, flexibility and toning. As an independent provider, not bound by any contract with any exercise brand, they are able to pick and choose the moves that they deem best for their protocol and particular style of TummySafe diastasis-aware workouts and routines. I tried the Pilates workout – Plain Ol’ Pilates. After having done Pilates for a year at our local gym, I have some experience with Pilates. The teacher has left so I can’t take the class anymore at our local gym, so I am left to finding classes online to get my Pilates fix. Pilates is one of my favorite workout options because it is not a fast moving activity. It is mindful and deliberate and works on the core which I love. I enjoyed the Pilates workout at Fit2B. I found it not too difficult because I have been working with Pilates before. For anyone with diastasis, there are modification all along the way, which is really useful. (It is not something I have had to deal with, but many women do.) The time went very quickly (this was a 26 minute workout). The owner of this online studio is certified in both Pilates and Yoga, so both are options here and sometimes they are worked together.